As a Catering Manager, I plan and execute events for a living. Quite simply, my job is a joy! I work with clients celebrating life’s happiest moments and somewhere in the process the clients become friends and their events become very personal to me. And, each and every one is my favorite until the music ends, the lights go up and the trucks back out of the loading dock. And then, it’s on to the next one. 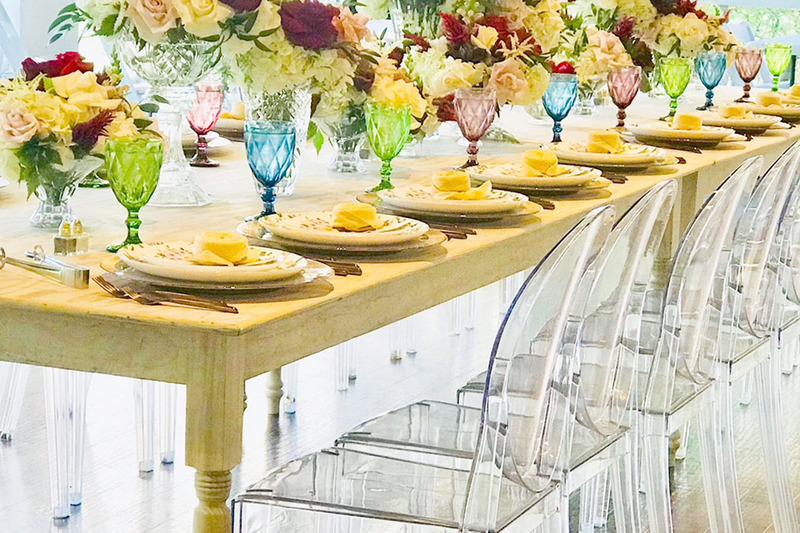 This summer, though, I had the opportunity to plan and cater an event that just might top the list of all-time favorites – a bridal shower for my future daughter-in-law. The thought of getting to do what I love, for someone I love, made me dizzy with excitement! 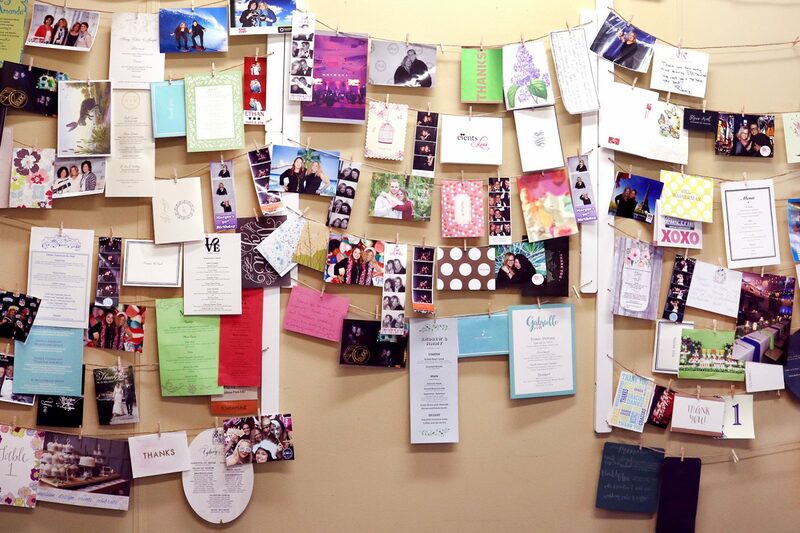 I have a wall in my office where I keep photos from events, notes from clients, and pictures from magazines, google searches and Pinterest. This is where I hang things that I loved doing, that I’d love to try or just plain LOVE! And this is where I turned for inspiration for Tracy’s shower. First, I needed a plan for the day…. Knowing that many guests would be meeting for the first time, I wanted an activity where we could all get to know each other and have fun doing it. It didn’t take me long to decide to host the shower at VisArts in downtown Rockville. They have a beautiful party space and great ideas for group art projects. 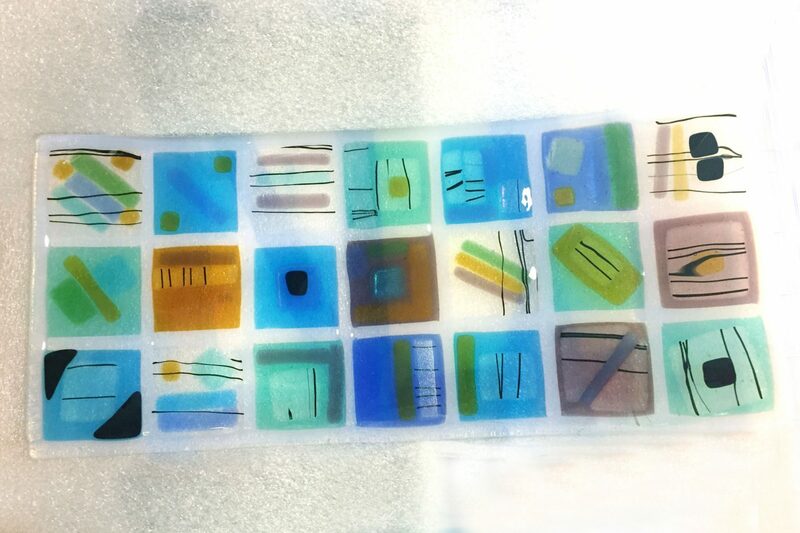 I chose a fused glass class where we all made glass swizzle sticks to take home. 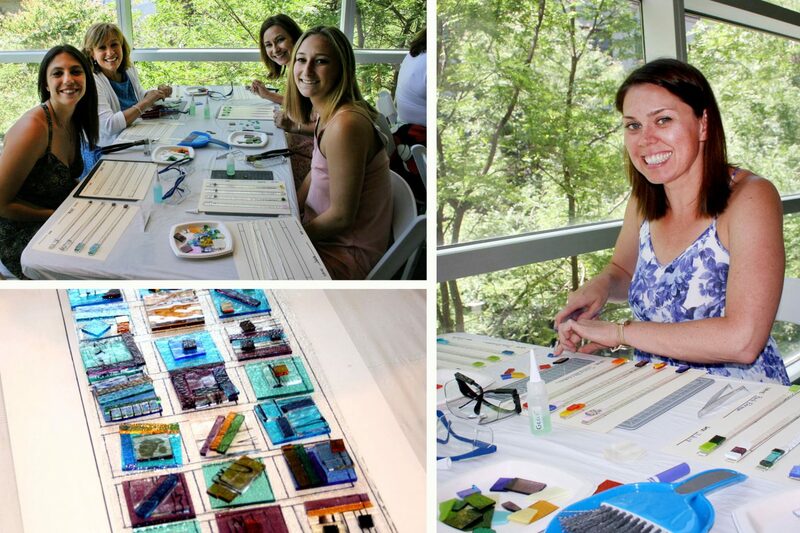 But the best part was that each guest created a 2” tile that would later be fused together to create a unique, one-of-a-kind serving platter for the bride and groom. Next, I called on some of my favorite “friendors” (vendors+ friends) to pull off my vision of an outdoor garden party for 20 women in an indoor party space that accommodates 150. The visionaries at DaVinci’s and Select Event Group did not disappoint. The farm tables and place settings were beautiful, fresh and classic with just a touch of whimsy. And, the flowers! Oh, the flowers! 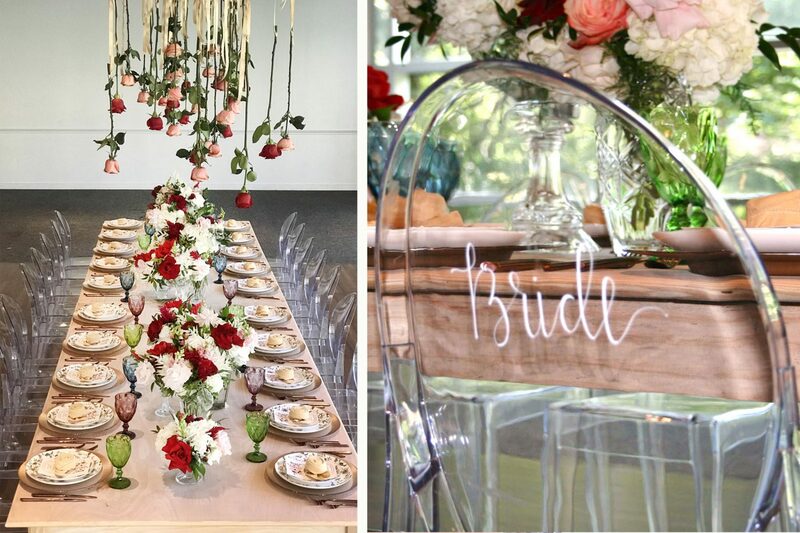 They came up from the table and hung down from the ceiling – it truly looked like a garden! For the lunch, I went with some of my favorites from our summer menu – Seared Chilean Sea Bass with a Tomato Beurre Blanc, Celery Root Puree and Roasted Summer Vegetables. 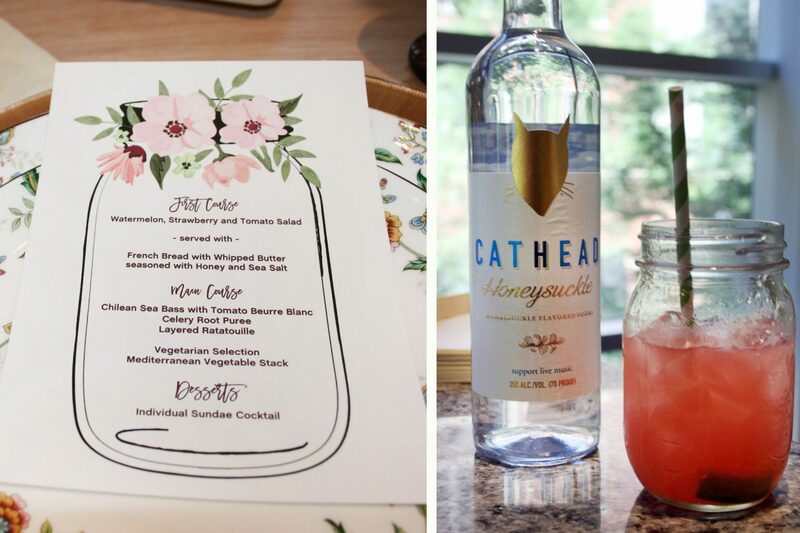 And, of course, the perfect signature summer cocktail – a Honeysuckle Vodka and Watermelon Cooler! My thanks to Kelly from Select Event Group for her incomparable eye, to Mickey at Davinci’s whose florals gave me goosebumps, to the calligraphy wizardry of Kristina Garcia who turned the ghost chairs into the most unique place-cards ever. And the talented artistic team at VisArts who expertly guided my guests through a fun and inventive art project/take-home party favor and helped us to collaborate on a piece that the bride and groom will treasure forever. And, of course, the fabulous menu was made possible by Executive Chef Kyle Vermuellen and the supremely talented team at Catering by Seasons.